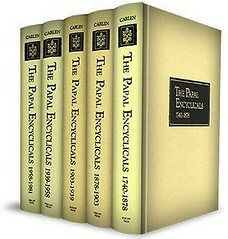 This is another selection from the reference section of the parish library which caught my eye: The Papal Encyclicals. It’s probably another way-too-ambitious undertaking, but I would *like* to read through them all. 🙂 Vol.1 covers years from 1740 to 1878. I’m hoping, like “The Book of Man,” that I will be able to make this a regular blog posting event. I’m liking the idea of posting more frequently and having certain topics that I can follow through on long-term.